These two tulips are nested together but looking in different directions much like sisters who bloom from the same roots but, with their unique personalities approach the world as individuals. This was a challenging painting with the subtle gradients transitioning in color over the large spaces of the tulip petals. I found many colors within the flower and enjoyed the contrast of the dark anthers reaching out from the center of the bloom. This watercolor is painted on 140# Arches Cold Press paper. It is framed with a Florentine gold, brushed metal 1" frame and a 3" white mat with archival backing and conservation glass. A Certificate of Authenticity comes with the watercolor signed by Sandy Haight. It is ready to hang for your pleasure. (The attached image shows a photoshop simulation of the frame with the approximate scale. The copyright notice is for the listing only). I’ve been using watercolor and ink brush line in my illustration work for nearly 20 years, but in a much more controlled and predictable way. My pictures appear on book jackets, ads, posters, logos and packaging all over the country and Canada. 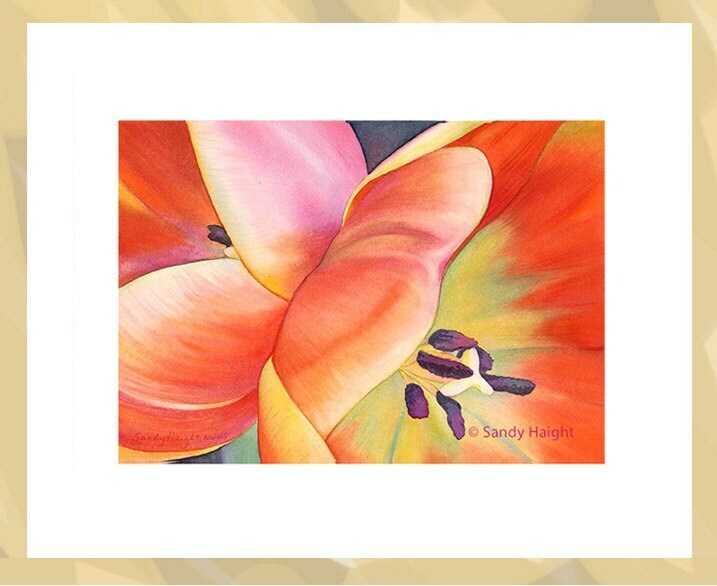 If you’d like to see my world of client driven projects, check out my published artwork at http://sandyhaight.com. My Watercolor Life Drawings, Sumi Figure drawings and watercolors are on my fine art web site at http://sandyhaightfineart.com and throughout this Etsy store. Teaching watercolor has recharged my interest in painting subjects that I love. In 2012 I qualified to be a signature member of the Northwest Watercolor Society (NWWS). This is earned by being juried into a select number of local chapter and international watercolor society shows sponsored by NWWS. The initials now follow my signature on my paintings. In 2016 I was the selected to be poster artist for the Skagit Valley Tulip Festival. This painting helped me win that honor.